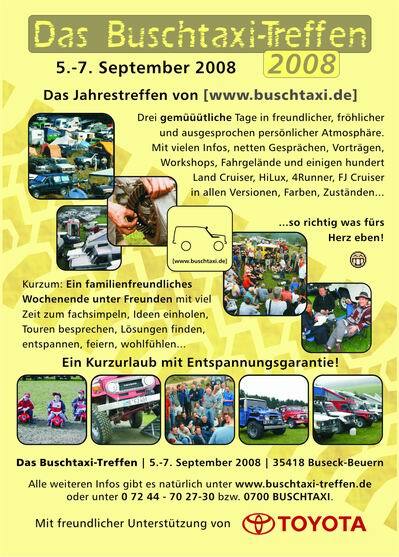 The Buschtaxi Meeting is the annual meeting of [www.buschtaxi.de]: Three days of friendly and private athmosphere with loads of information, discussion, talks, workshops, offroad driving area and a few hundred Landcruisers, Hiluxes, 4Runners…in short: A family-friendly weekend with much time for talking, making plans, getting ideas, finding solutions, relaxing, making party - a short holiday with fun guaranteed! This years meeting is from September 5.-7. and it´s located in 35418 Buseck-Beuern, Germany. All further informations here, in our message board, via email or phone: 0049 72 44 70 27-30.